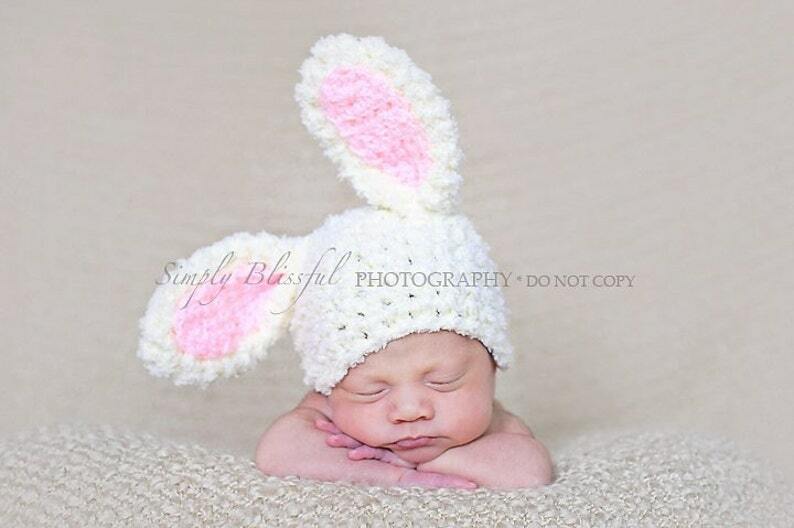 Baby Boy Hat or Baby Girl Hat Fuzzy Bunny Beanie Easter Photography Prop Ready Item is cute, fuzzy, and wonderfully soft - just look at the picture! I can make it with blue ears for the boys or with pink ears for the girl or brown ears - gender neutral option . If you need bigger size - let me know! If you don't specify the size and the color in the message to the seller during the checkout process I will make it in newborn size and in the color in the picture ( white with pink ears). Baby Boy Hat or Baby Girl Hat Fuzzy Bunny Beanie Easter Photography Prop Ready Item is hand made with love in my smoke free home. MADE IN USA item! Acrylic yarn I used in this hat is made and distributed in USA and is non-allergenic, moth- and humidity- proof,and easy to care: hand wash in cool water, remove the excess water and lay flat to dry. So cute; I Love it!